This is going to be an example of knowingly repeating myself. I've previously blogged about this book. Therefore, I will attempt to repeat AND move the discussion forward rather than just repeat myself. There is no doubt in my mind that insight mapping is where I have done my most original work and it is where I can contribute most new knowledge. I may have a decent handle on synthesis and analysis of other people's work, but this is where I can contribute something unique and NEW. Obviously it's not completely unique since I'm talking about this book which explores something very similar. Still, I think I have something that adds to this book. So, if I wanted to write a book and I wanted it to explore new territory, it would definitely be about insight mapping. The authors differentiate between "cognitive mapping", which refers to individuals mapping their own thinking and "oval mapping." When a group is involved in mapping their ideas as a group, the authors call it "oval mapping," but this is only a reflection of the shape of cards being used to record and aggregate individual input into a group map. I've had similar difficulties finding suitable names for the maps I've created over the years. I've called them knowledge maps, conversation maps, and now I've settled on insight maps. Knowledge maps have a different meaning in Knowledge Management and should not be used to refer to this adaptation of concept maps. The term "insight map" is specific enough to convey the general purpose of the mapping (i.e., to generate useful insights), yet applicable to a a wide range of situations where insights into a complex situation are being sought. While mapping can be done to facilitate decision-making (the previous blog post on this topic had provided a simple demonstration), it can be done in support of other relevant business activities. Define "insight" and its relationship to knowledge creation. Develop a succinct definition of insight mapping to be integrated in all Fillip Consulting materials. Come up with a menu of situations where insight mapping can be effectively applied, or develop a fact sheet based on the format used by KM Approaches, Methods and Tools. 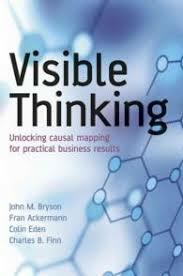 Applied Concept Mapping: Capturing, Analyzing, and Organizing Knowledge (2011) by Brian Moon, Robert Hoffman, Joseph Novak and Alberto Cañas.